There are two types of solitaires that have been proven to have been seen in North America. The Townsend's Solitaire is the only native solitaire of these two and whose habitat ranges from northern Alaska into Mexico. The Brown-backed Solitaire is a vagrant, sometimes seen in the extreme southwestern border states of the US. Another possible solitaire that may be identified one day, is the Cuban Solitaire which as the name suggests is a Cuban endemic, that may show up in southern Florida driven there by a storm or just a wayward vagrant. 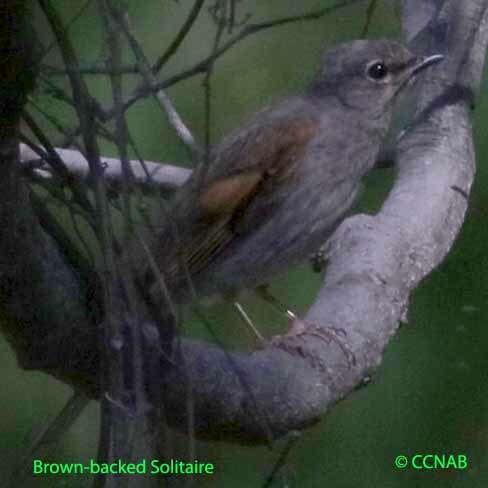 The solitaires are members of the thrush family whose habitat is found mainly in forests. More likely to be seen up in conifers feeding on insects and berries. These birds on occasion will show up at birdfeeders in the south or even in residential backyards if there are winter berries available.